One of the best things about being a part of “Kangaroo Nation” is that there are friends in every port. Marian Wright Edelman has been selected as the recipient of the 2012 Austin College Posey Leadership Award. The founder and president of the Children’s Defense Fund will be honored in April and share her experiences in events on campus and in Dallas. The six Austin College graduates awarded Fulbright grants for 2011­-2012 travel to South Korea, Columbia, Germany, and Croatia were enough to place the College among the top producers in the nation. Texas plant expert George Diggs, professor of biology, set out to Antarctica to see what examples he might find there to connect his students with their coursework. 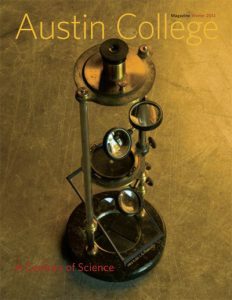 Sciences always were a significant part of the Austin College education but in 1911 as the curriculum expanded separate departments developed. With new improvements—like electricity!— science education continued to grow, and in 2011­-2012 is celebrated at 100 years of educating men and women for success. The IDEA Center observatory with its custom ­built telescope will set Austin College apart for top­notch undergraduate astronomical research and community outreach opportunities. Since his training in Einstein’s general theory of relativity, physics professor Don Salisbury has sought answers to big questions. He hopes to inspire his students to similar pursuits.